This figure was part of a find from a Hong Kong warehouse in the late 1980's and was put onto the collector's market by an Australian outfit in 1993. I don't believe it's an error, but more of a sample of sorts because the other two figures offered at the time were unpainted first shot ROTJ figures (Bib Fortuna and Rebel Commando) , but on ESB Lando Calrissian cards. 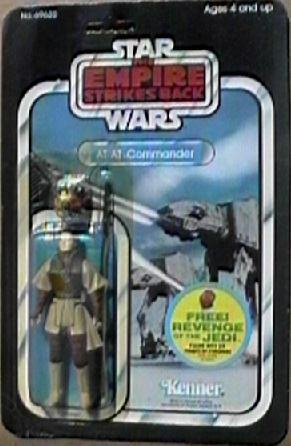 Since these other two figures were prototypes then it stands to reason that they were all purposely put onto ESB cards because ROTJ cardbacks were not available at the time. They may have been constructed to be tests for the proposed bubbles/packaging for these new figures. Both the card and the figure shown here are standard, though the bubble is a little shorter than on the regular Boushh figure.